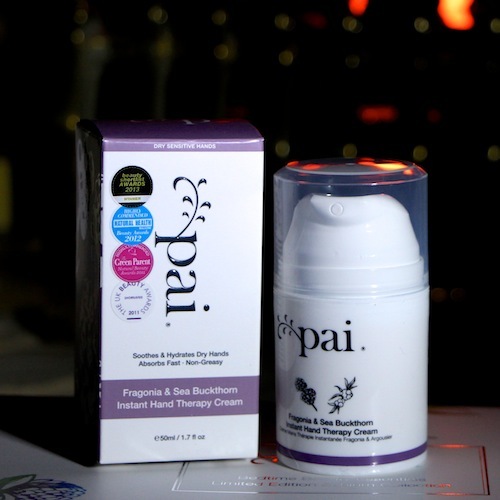 A nice reader offer to end the week: Pai Skincare are giving away a free, award-winning Fragonia & Seabuckthorn Instant Hand Therapy Cream with every order of £30 and over. This includes the beautifully packaged Christmas gift sets which are priced at £30 for the skincare versions and £80 for the bedtime essentials. My favourite is actually the Rosehip Collection for intensive nourishing – I love the Rosehip BioRegenerate Oil and the set also includes a powerful mask (that can’t be bought separately) and a washcloth. The bedtime essentials kit (here) contains an Echium Eye Cream (one of my top ten products), an Age Confidence Oil and a luxury, lavender-filled sleep mask. You may be wondering why my photos have a fire burning in the background: last night saw power cut number 2,341 since moving to the country and so I had to continue my work by the light of the gas fire and a powerful torch. (Though not as powerful as the one on Mr AMR’s Christmas list. Perhaps his ideas aren’t so mad after all…) Anyway, I think that the flames are quite atmospheric and wintery but there was a distinct downside to this setup, namely that everything started to heat up so much that the boxes almost caught on fire! You can read more about the hand therapy cream here (it’s rich in active ingredients that help to increase cell renewal and make skin look smoother and altogether more presentable, perfect for chapped, cold hands) and if you want to take a closer look at the gift sets, then they are here. The code you need for the free cream is MODELHANDS and the offer finishes at midnight on Sunday. Minimum spend is £30 for the UK, €30 for Europe and $50 in the US.